This week was a bit of a sad occasion: our food appreciation classes spent their last day in Africa on their virtual culinary world tour. Currently in Morroco, we made this classic salad of orange sections and Romaine leaves, flavored with citrus, cinnamon and orange blossom water. This salad would not be the same without the orange blossom water, so it is definitely worth seeking out. I finally found it in a small, Middle Eastern market. But it’s also available online. Distilled from bitter oranges, it smells–and tastes–like perfume. It is only edible when mixed with the other ingredients in the salad dressing–including sugar–but the resulting flavor is memorable. First, remove any bruised or damaged leaves from a head of Romaine lettuce. Chop the remaining leaves roughly, then rinse thoroughly and dry in a salad spinner. Refrigerate while preparing the oranges and mixing the dressing. Use a sharp knife (I prefer a serrated bread knife) to slice the peel and outside membrane from three succulent oranges. This is a procedure most kids have never seen before, so be sure to demonstrate each step slowly. Working over a mixing bowl to capture any juices, section the oranges by cutting away all the inner membranes from the flesh. Set the sections aside. Using your hands, squeeze the juice from the clumps of membrane into the bowl. In a second bowl, thoroughly mix 2 tablespoons of the orange juice (you can drink the rest) with the juice of 1 lemon, 2 tablespoons sugar, 1 tablespoon orange blossom water, 1/2 teaspoon cinnamon and a generous pinch of salt. Note: there is no oil in this dresseing. Pour the dressing over the salad greens. Add 3/4 cup chopped walnuts and toss. Distribute the salad onto plates and garnish with the reserved orange sections. Dust each salad with a bit of cinnamon and serve. Kids can be encouraged to try different foods if they’re involved in the process of preparing it. There’s lots for them to do maing this salad. 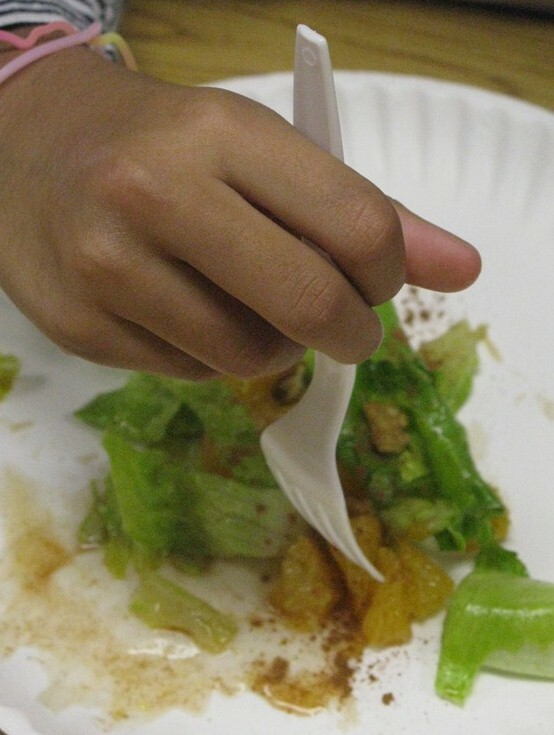 They get to cut the lettuce and spin it dry; squeeze the juice out of the oranges and the lemon; stir the dressing and pour it over the salad greens; toss the greens with the walnuts. They can also help put the salad onto plates and garnish with the orange sections. And of course the adults get a great sense of accomplishment watching the kids actually eating the salad. I was making a Moroccan dinner last. Needed a green salad. Had a fridge drawer full of oranges . Had Orange Blossom water(in cupboard for 1+yrs), who knew. Had walnuts also. The scene was set for this salad. Did not know how husband would react?? A big success on all scores!! It was wonderful and light with the other heavy Moroccan dishes I prepared! Glad you were able to make such good use of this recipe, Sylvia. It is a great salad.